In Stock: Usually Ships In 3-5 Business Days. White Lola Accent table from Arteriors is sure to be a conversation starter. 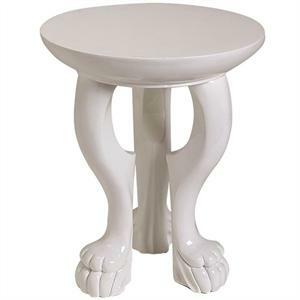 The three legged table features an eye-catching double claw-foot design that will certainly make you look twice! A fabulous piece of work to compliment a variety of decor. Lola accent table adds personality as well as a glamorous glossy lacquer finish.